Your comments and suggestions are very much appreciated! To review your orders, access your registration information or change your e-mail settings, login to your account. Click here to access your registration information. If you have lost your account password and no longer have access to the account e-mail address, contact Support via e-mail and include the full name, address and e-mail address used when purchasing the software. To enter your registration information, go to Control Panel > Personalization (Control Panel > Display on Windows XP and earlier), select screen saver settings, then select VideoSaver from the list of screen savers, click on Settings, then select the About tab and click on Enter Registration Code. If you get an error message when entering the registration information, or if the software is still running in trial mode after entering the registration information: make sure you have entered the name in the first field (Registered to), and the registration code in the second field (Registration code). The name needs to be entered exactly as shown in your registration information. This happens due to a corrupted download, for example because a proxy server on your company or internet service provider's network has cached a partially downloaded copy of the setup file. To fix this, try downloading again later. Some users have reported that downloading with the Firefox browser fixed the problem for them. 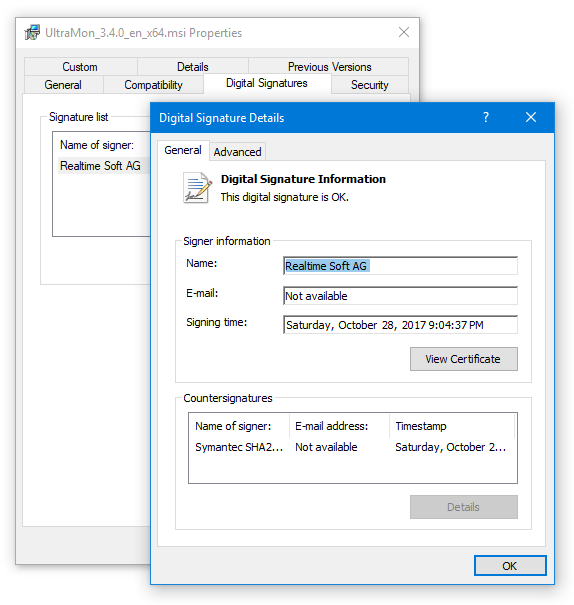 Click here for a screenshot of the digital signature dialog. If the digital signature isn't valid or is missing, the file has been corrupted during downloading or has only been partially downloaded. This can have several reasons. First, make sure that the file hasn't been corrupted during download, as described above. If the .msi file is okay, try copying it to the root directory of your system drive, usually C:\, then run setup from there. The main part of setup runs under the SYSTEM account, so that account also needs read access to the setup file.